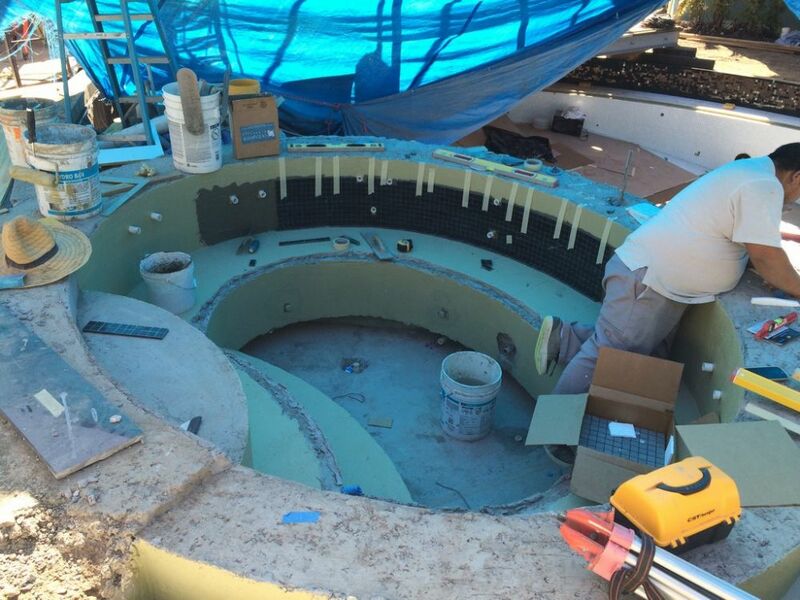 The pool and its spa may have simple shapes, says Jimmy Reed, but when they're finished as boldly as these are with glass and stone tile and custom-cut granite edging, you learn fast that basic contours pose unique challenges when it comes to producing visually flawless surfaces. If I’ve learned anything through the years, it’s that a successful, truly satisfying project generally requires a good client and, quite often, a great project team. 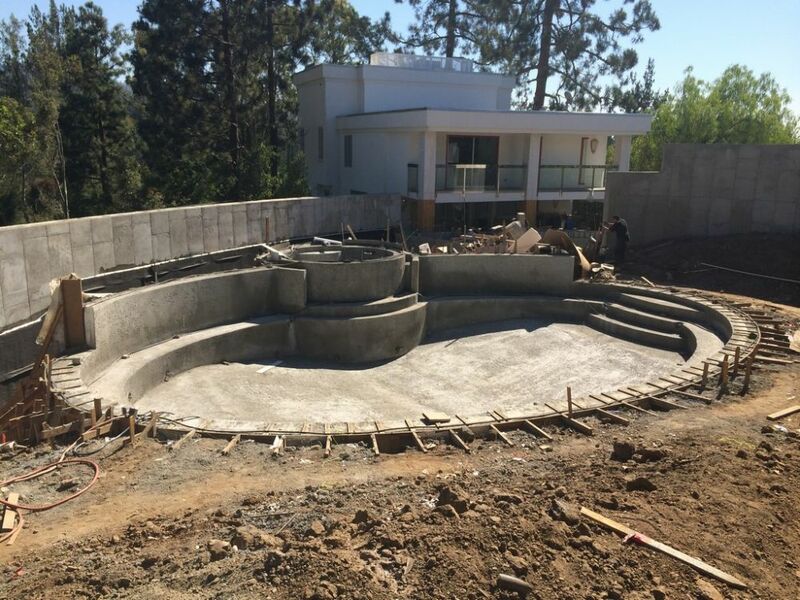 What the good client was after in the project discussed here was pretty simple – that is, an oval-shaped pool to go along with a large, oval-shaped shade structure another contractor was to install alongside it. 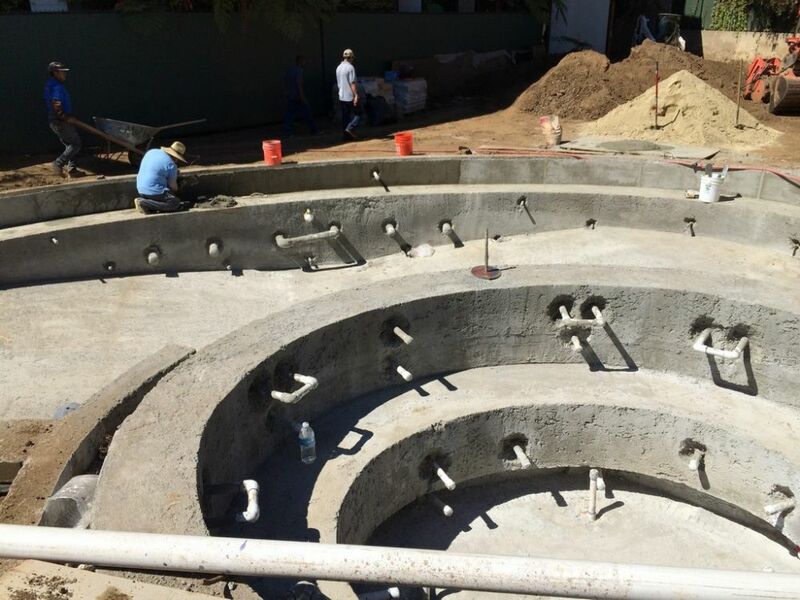 Making a fine start, the client called in Skip Phillips of Questar Pools & Spas (Escondido, Calif.) to take care of the design work and was soon presented with plans for a remarkable swimming pool and spa. 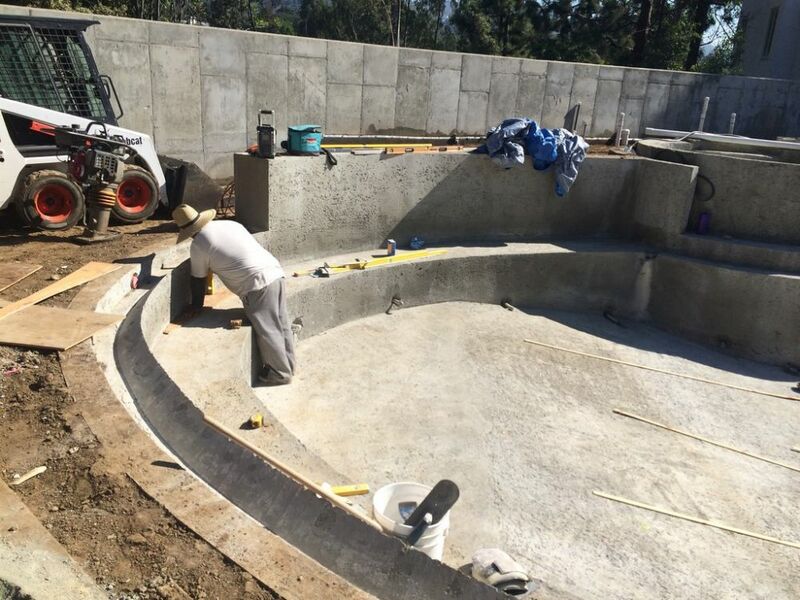 Next in line came Dave Penton of Fluid Dynamics Pool & Spa (Fullerton, Calif.), who was tasked with building the watershapes. 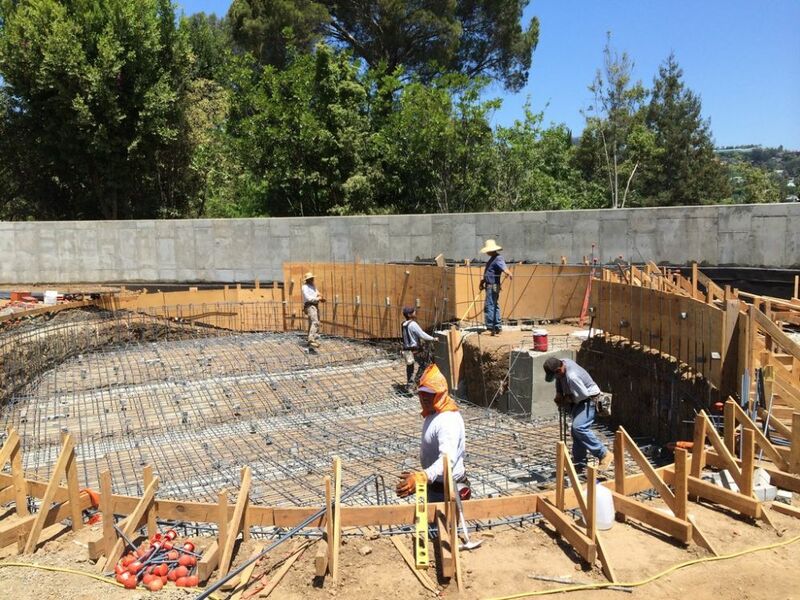 Given the proposed, mostly glass-tile interior finish, he called us at Rock Solid Tile (Calabasas, Calif.) – and the core of an excellent project team was ready to roll. Immediately, of course, Dave and I recognized the fact that simple forms are very often the product of intense, intricate construction. 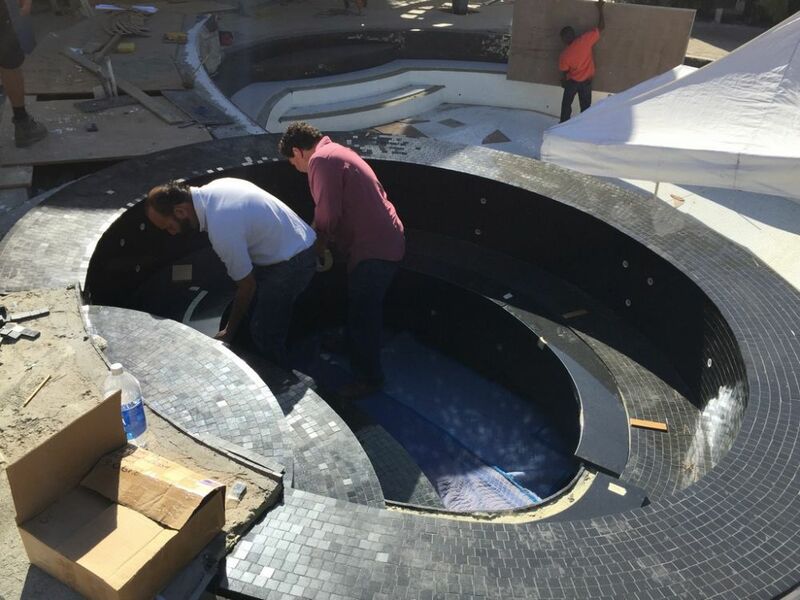 As designed, the large, oval pool was to feature a perimeter-overflow Lautner edge surrounded by a ring of custom-cut, black-granite coping. 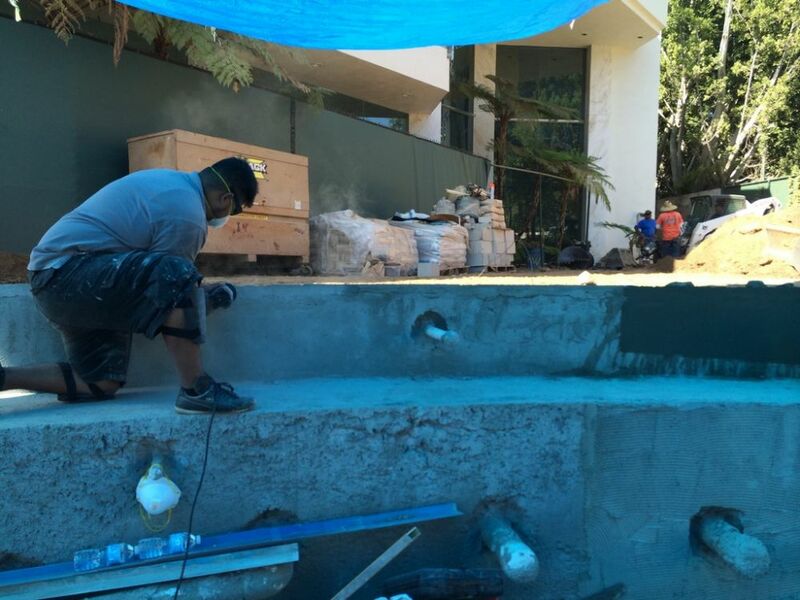 Inside that edge was to be a bench that would run around the pool’s full perimeter. 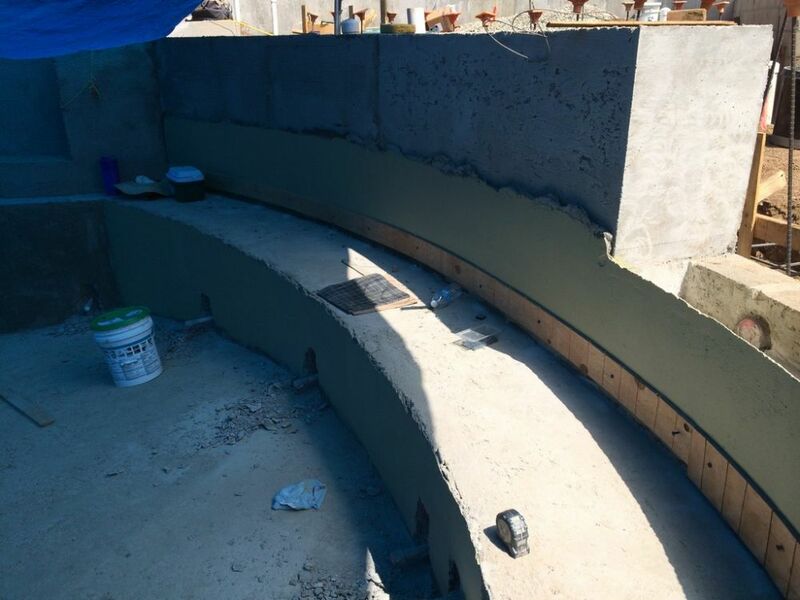 The bench’s edge was to be completed by another black-granite detail. 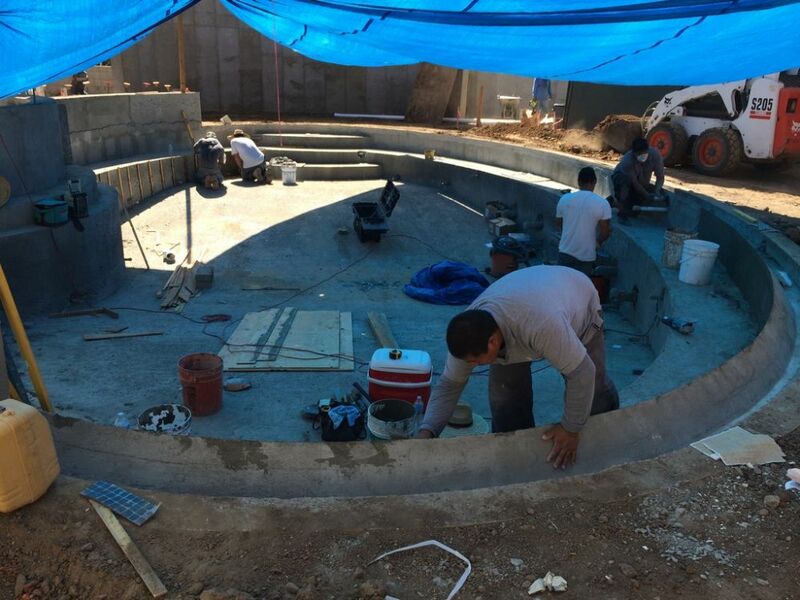 At the end of the pool near the shade structure was to be a set of wedding-cake-style steps (also surfaced or edged in black granite) that emerged onto a flat section of the pool’s floor. 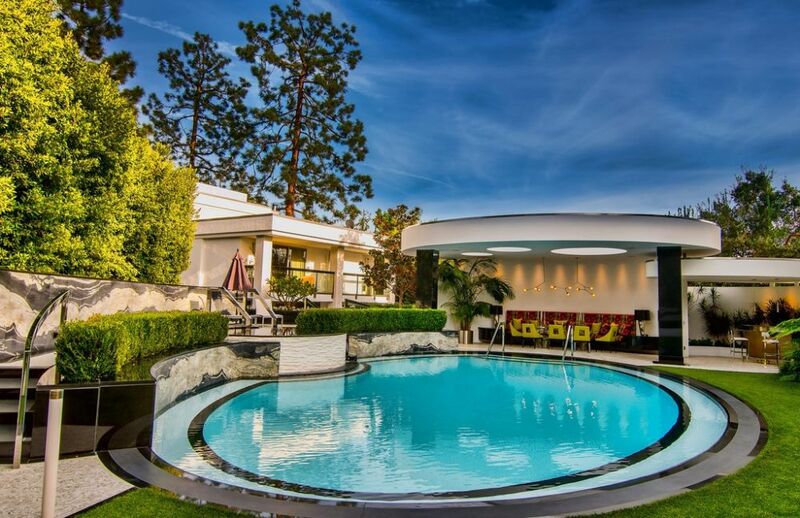 There was to be a flat surface on the opposite side, too, and from both sides the floor of the pool would slope down to a relatively shallow hopper in the middle of the pool – over which would loom a large, round spa. 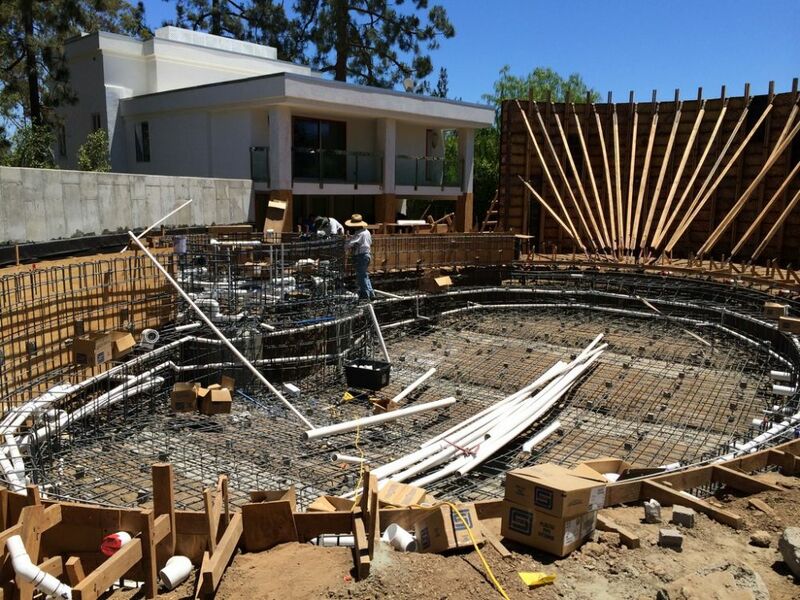 The job site was helpfully spacious and essentially flat – but the lot was atop a slope, so the retaining walls and the pool shell both required extensive, engineered support. 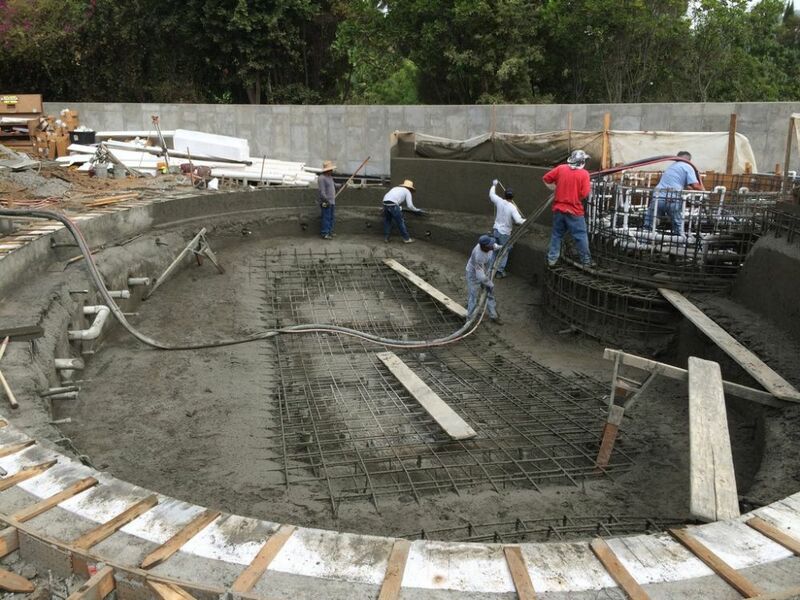 Once the pool’s foundation was ready, we participated in preparing the cage and in concrete application, monitoring key dimensions and spacings to make certain the finished shell would be about as ready as we could make it for its all-tile finish. 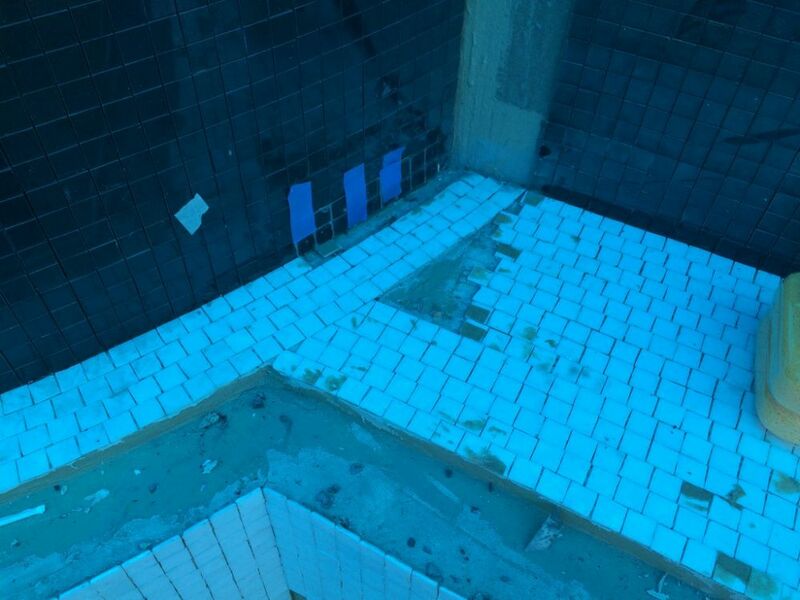 The pool’s interior was to be a white glass mosaic tile draped beneath a black stone tile running from the waterline down to the bench surface. 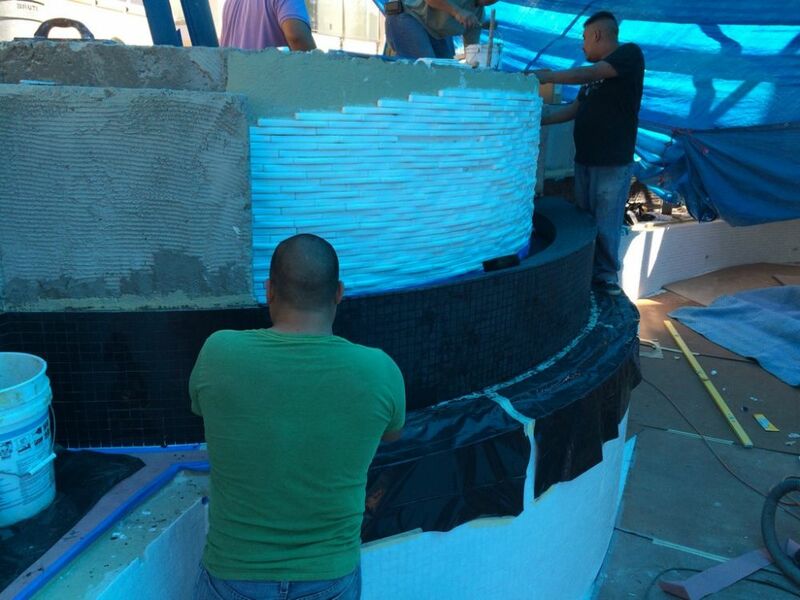 The spa was to be done all in black stone tile, while its dam wall would be covered with the undulating Elevations Stratus series of tile from Oceanside Glasstile (Carlsbad, Calif.) in a custom blend of white iridescent and white non-iridescent. In short, it was an assembly of elements, details and materials that, in the right hands, promised dramatic visual results. This is one of those happy projects in which we, as the tile-installation contractor, were involved in the project from the start. As a result, the steel was tied and the shell was installed in a way that was as favorable as possible to our work – no surprises, no huge adjustments to make either through addition or subtraction, no drama at all. 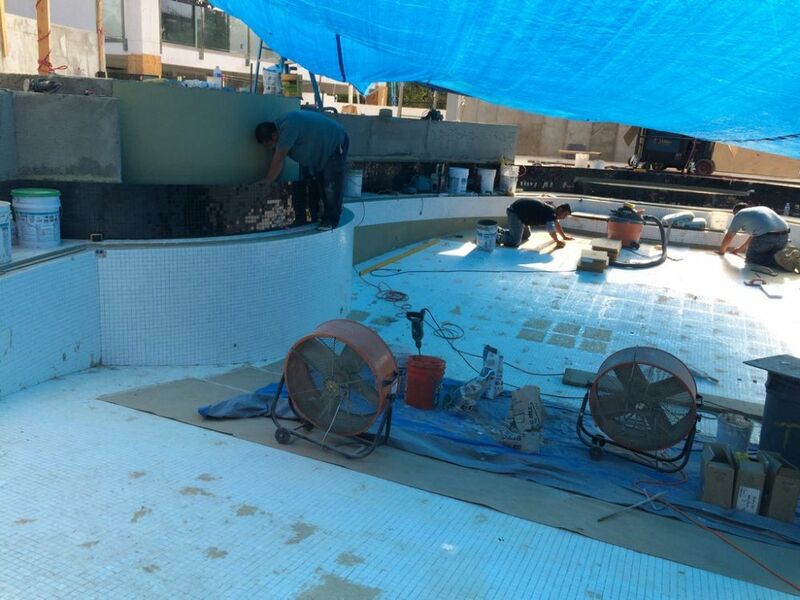 Once the shell was ready, we swarmed over its surfaces and prepared the way for tile application. 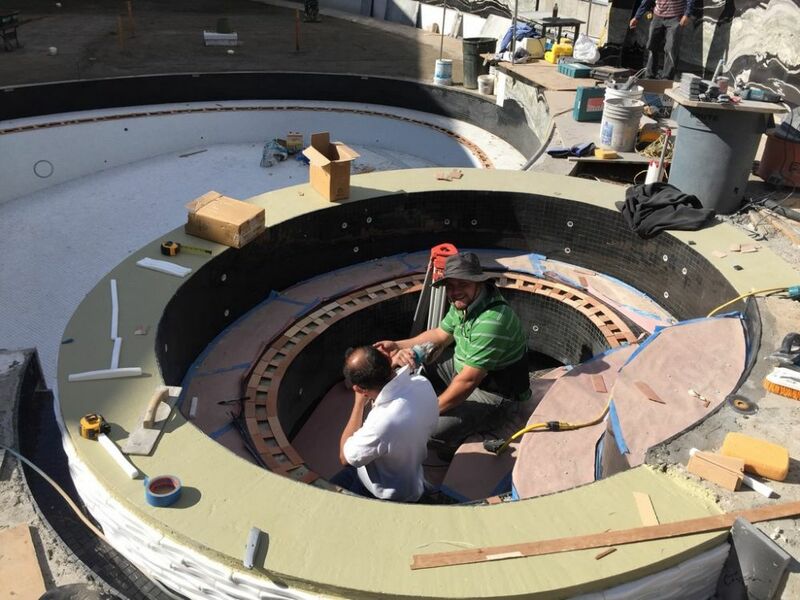 The surface-preparation phase is always both exacting and laborious as our crews check contours and build up certain parts of the shell to get them just where they need to be – or grind away other parts to lower their profiles. It takes time and a large number of highly skilled workers, but we all know that even small dimensional errors can project onto the finished surface as obvious visual intrusions. 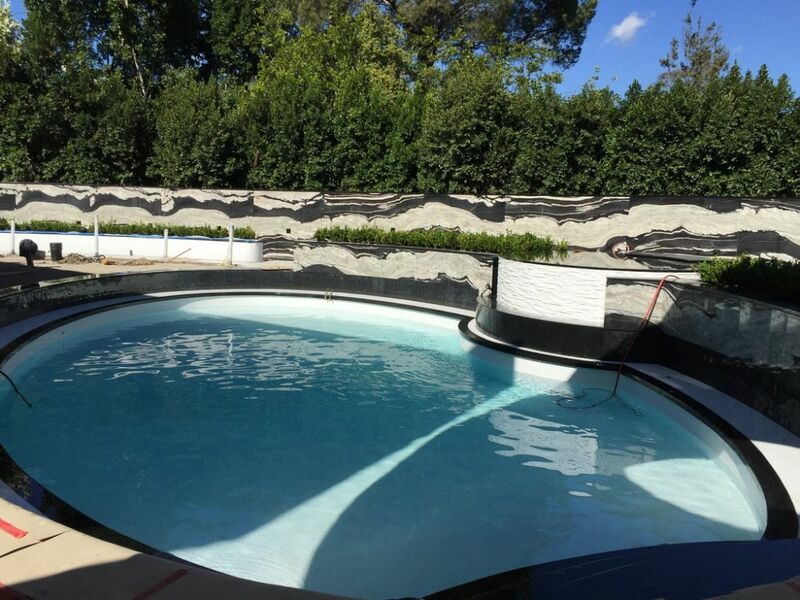 But of course, even though the shell was ready and easy to work with, there was considerable, painstaking tile-application work to be done because of the curving surfaces and all of the granite edging: It was at the transitional point from preparation to installation that we truly appreciated just how long the pool’s perimeter actually was – and the full implications of the fact that our tile had to set dimensions for long, radiused sections of granite that couldn’t even be fabricated until after we were done with tile installation and could prepare the necessary templates. 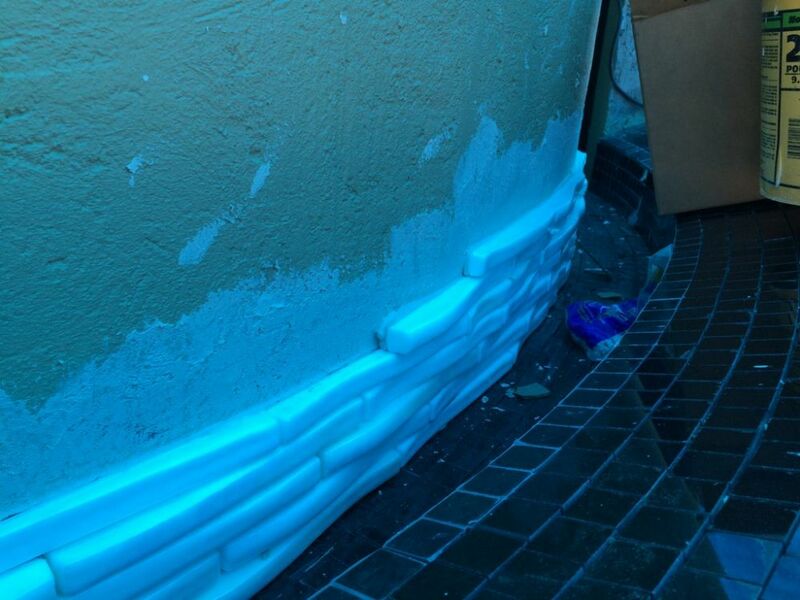 For us, this sort of detailed work falls under the heading of “routine but intense.” Our installers are trained to pay attention, ask questions and get things right, because they know for a fact that if we misstep in any way, the unacceptable work will have to be chipped out to make way for a fresh start to get things right. Where the pool’s interior was routine but intense, some of the work related to the spa was just plain intense. 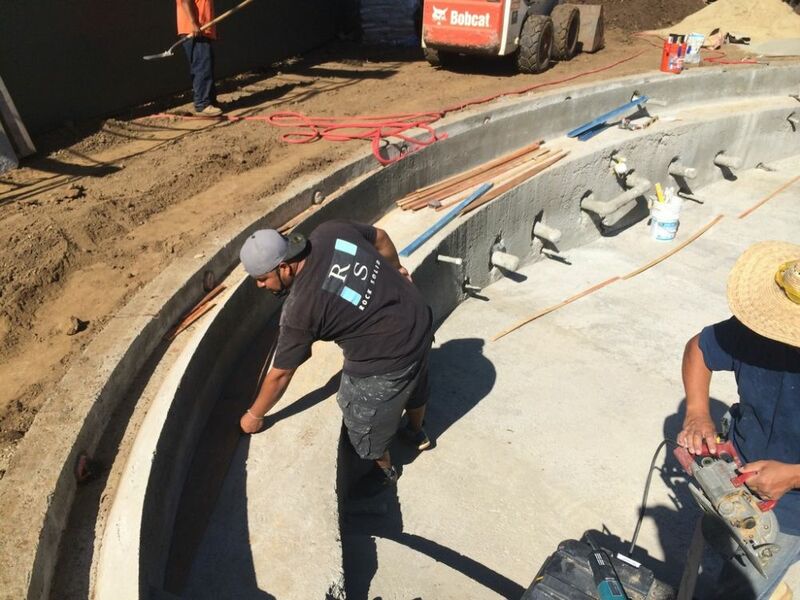 As designed, the round spa had a 320-degree overflow edge with the back two-thirds or so flowing into a narrow, relatively shallow slot while the final third flowed down a tall, highly visible section of dam wall. The conventional approach would’ve seen the water from the narrow trough and the wall flow straight into the pool, but the surface turbulence that would have resulted from such a direct approach was just not acceptable. 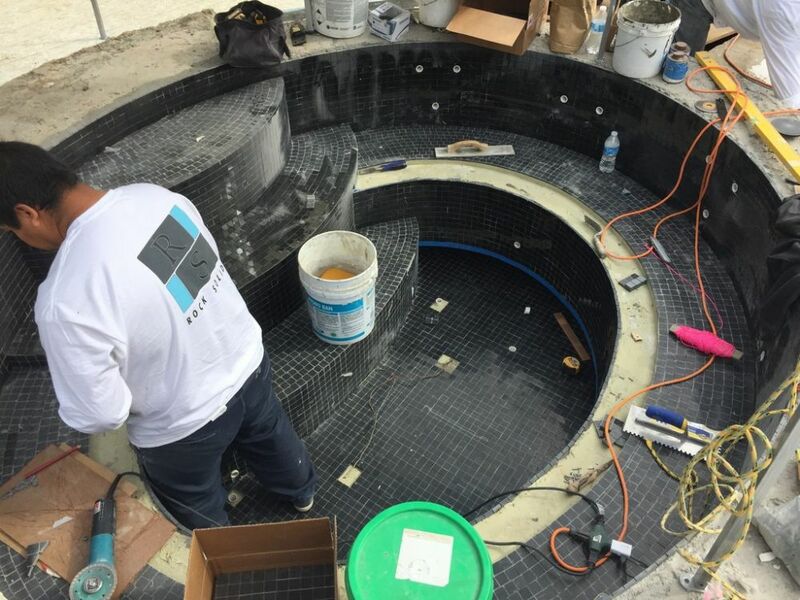 Once the surfaces were ready, we begin our application work at the waterline with a black stone mosaic tile that reached down to the top surface of the full-perimeter bench. 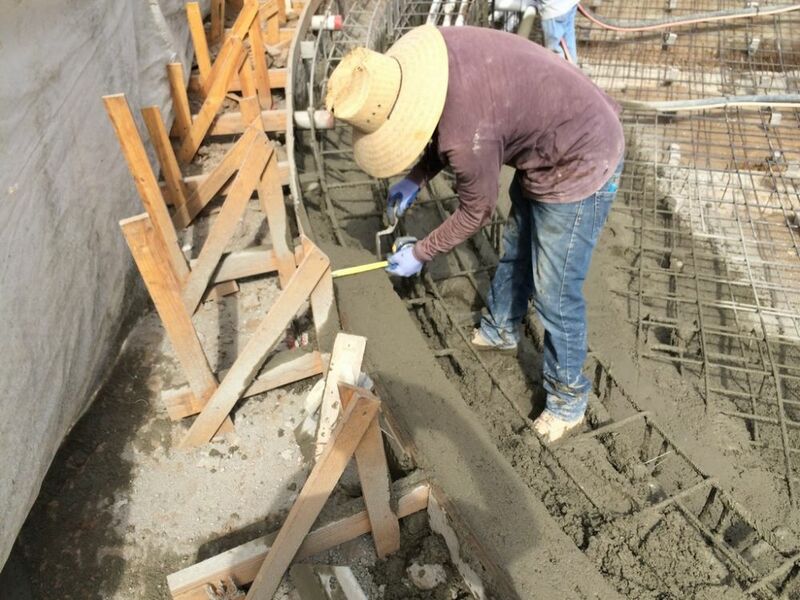 Some of us moved on to prepare the Lautner edge’s trough, while others began working on the walls and floor. 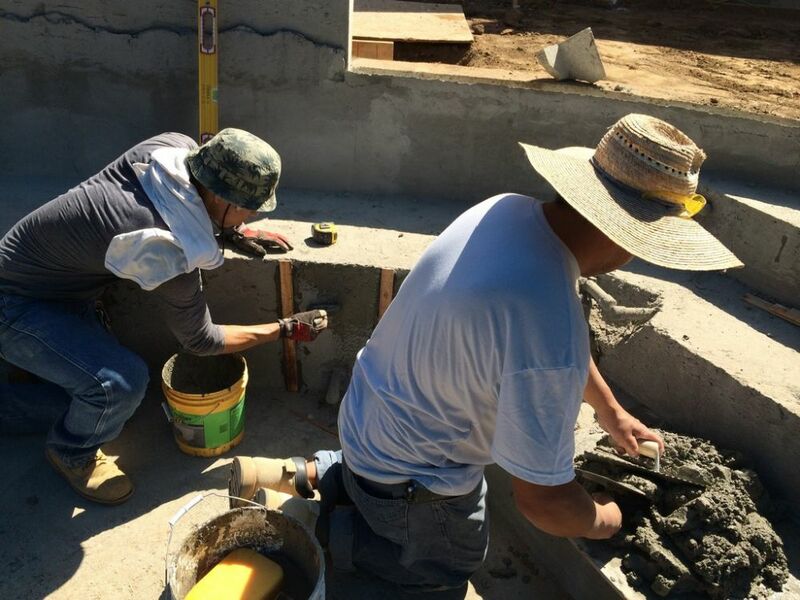 The work can move along at a good pace with such large fields of tile, but there are also ample opportunities to slow down and work through the details of various intersections. And in this specific case, we also had to be mindful of the stone edging that would eventually fit into the notches we had prepared for them on the bench and steps. As a result, the design included a narrow continuation of the overflow trough down at the base of the dam wall, the entirety of which was covered with a highly irregular, undulating surface – thus producing an active, tuneful cascade. 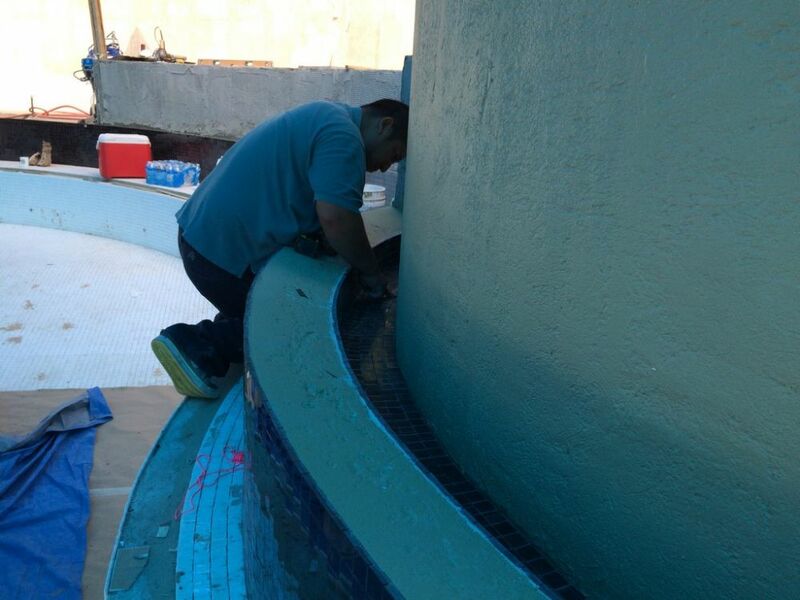 All of the water flowing over the spa’s edge was to collect in this small trough before rising to flow over an almost-flush vanishing edge set an eighth of an inch above the pool’s water level. 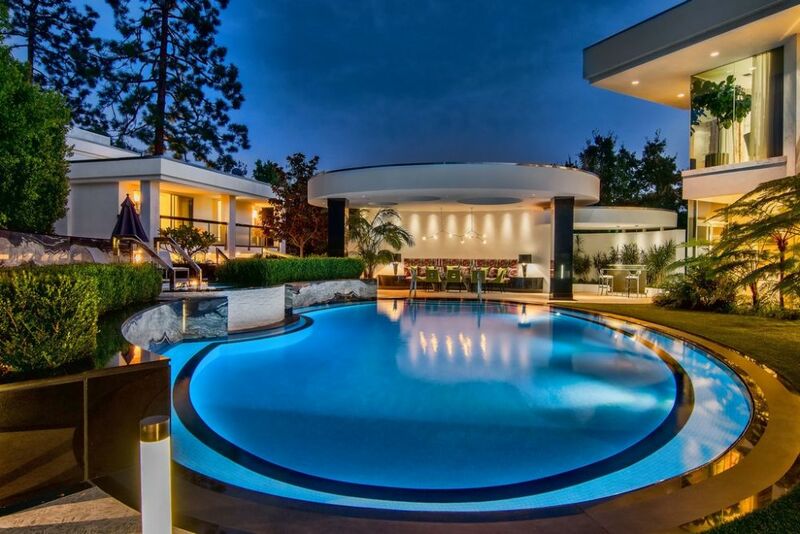 The spa’s water thereby entered the pool with minimal effect on its serene, mirror surface. 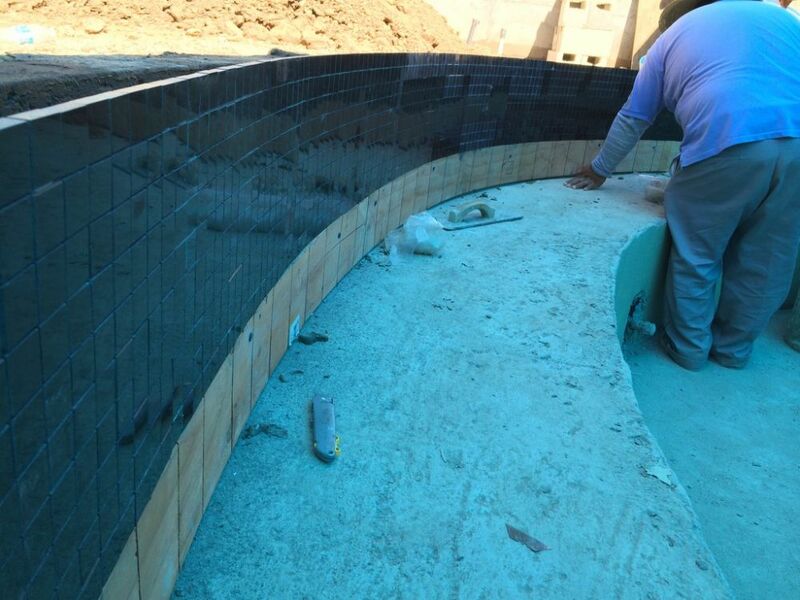 But this meant a ton of close work in narrow spaces and, in the case of the dam wall, of individual placement of tile pieces to achieve the desired irregular profile within a long section of narrow slot. Here, intense may be too light a word; maybe “arduous” or “agonizing” would be more accurate. 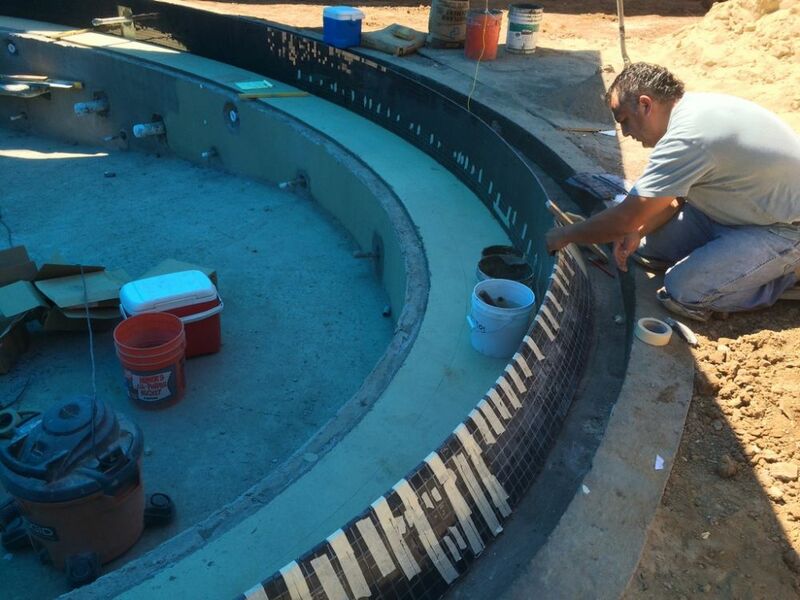 Over in the pool, we completed the not-so-arduous but always intricate work with sections of glass tile on the bench, steps and floor – so now it was time to make the abovementioned templates for the bench- and step-edge details. All through tile installation, we’d had to maintain precise distances between the edge of the tile field and the exposed edges of the bench or steps – not to mention watching for a precise thickness of finished tile rising above the shell’s surface – to allow for insertion of granite pieces that would extend slightly past the tiled edge with a crisp, square nose detail that accommodated a hidden LED rope-lighting system. 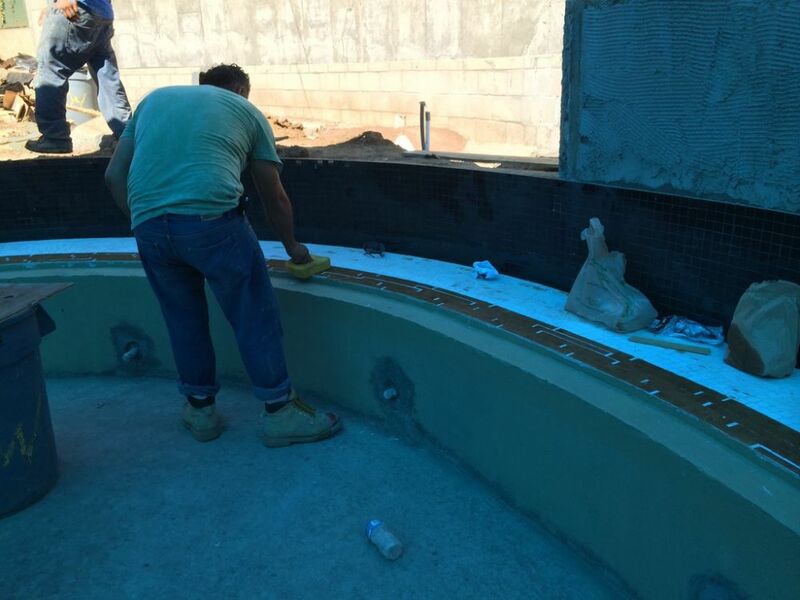 Our work on the spa was similar to what we’d done in the pool – except for the tighter radiuses, cramped working conditions and numerous narrow spaces. 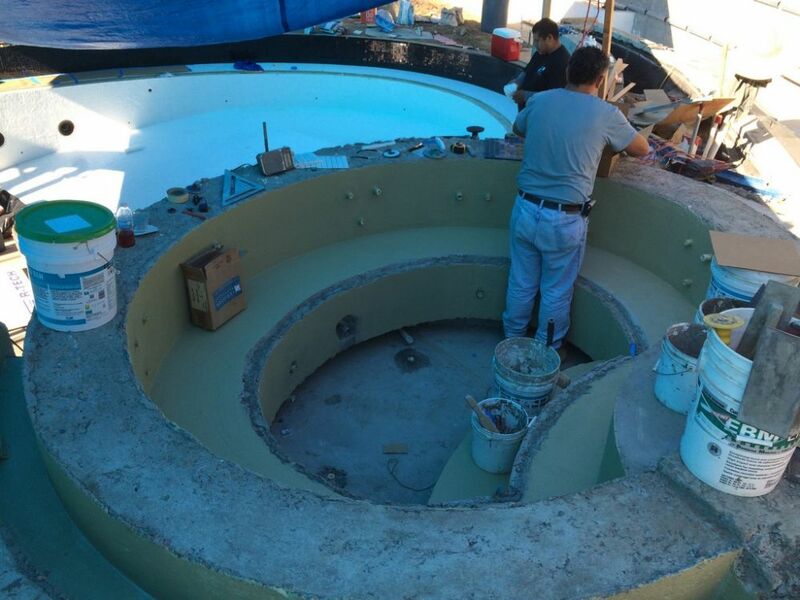 Here and in the pool, we eventually reached the point at which we could prepare templates for use by the stone fabricators in making the coping and the various interior edge details. It was a rare pleasure (and something of a relief) to see how beautiful these large, polished pieces of stone looked once installed. It was something like a three-dimensional chess game in which every move had to be mapped out well in advance so that all of the relationships would work when the granite, each piece custom-radiused and cut for specific placement at a specific point on the oval’s arc, would arrive and we’d finally know if we’d won the game. Happily, it all worked the way it should have, and now the white fields of tile set off the black edges in ways that make me wonder if purple would’ve been the right tile-color choice after all: The white-on-black look is incredibly dramatic, and that sensation of its uniqueness only became stronger as the pool filled with water and we saw the composition’s grandest illusion – that is, that the benches appear to rise to near water level as though they formed a broad, shallow wetted edge flowing to the overflow slot. Truly remarkable. A crowning touch for the poolscape is the white and black stone paneling that surrounds the yard and was added to raised walls flanking the spa to tie everything together. 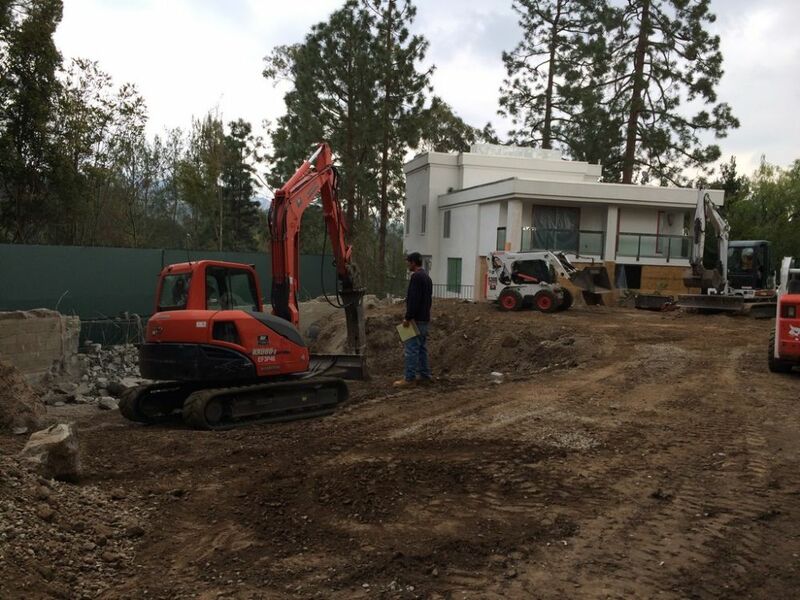 We were happy to let the stone contractor take care of this part of the project, basically because the material isn’t all that easy to work with – and so many cuts had to be made to fit the radius without disrupting the pattern. Also featured is the brilliant shade structure, oval in shape and with circular cutouts that cast ovals of light onto the walls and decks below. 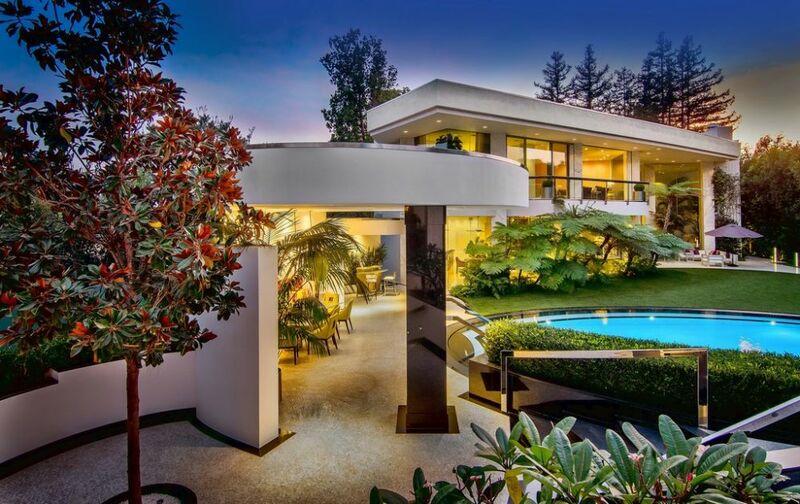 It’s a cool detail – and complements the shape of the pool in a helpful way, given the streamlined, angular forms of the home and the guest house. 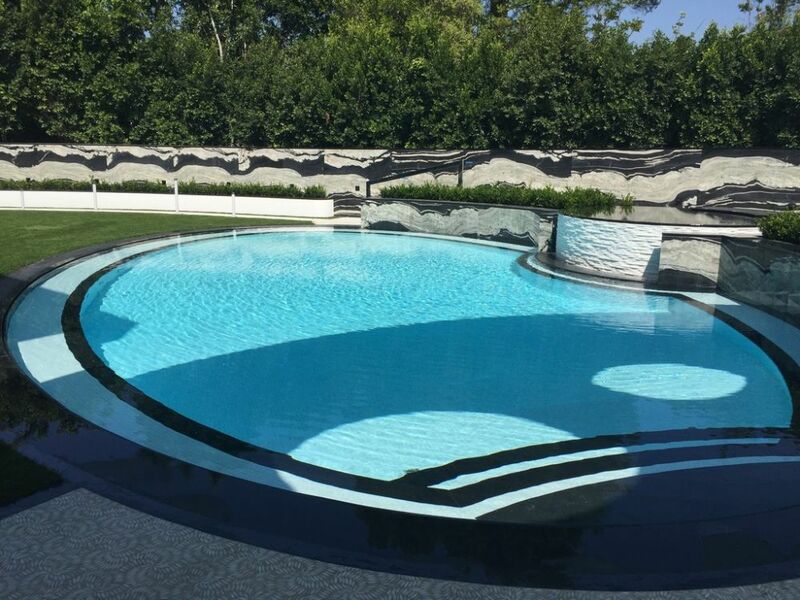 Our pride and anticipation rose as we watched the water level move up inside the pool and, on that sunny day, saw ovals of light pass through the shade structure’s cutouts to move across the pool. The entire composition became even more dazzling in the following months, as the landscaping grew in and the railings finally arrived – an amazing outcome for a fantastic team effort. In any project on this level, where the watershapes are genuinely intended to serve as a form of sculptural art, the stakes are unusually high and the tolerance for any form of visual error is witheringly low. As was mentioned at the outset, we had the best possible shot at making it all work because everyone on the project team was operating at the highest possible level and, as important, respected the fact that others were involved in the process and had their own tasks and goals. It’s amazing and fun when, as with this project, everything snaps into place and you can watch the results of all the hard work ultimately come together, element by element, detail by detail. In this case, the entire resulting composition is a visual delight, while memories of the collaboration rank right near the top of the stack. It’s an artful oval, one of a kind.